14 NovWhat Does a Strong Balance Sheet Look Like? What makes a healthy balance sheet? Balance sheet depicts a company’s financial health. It records all your business’ assets and debts; therefore, it shows the ‘net worth’ of your business at any given time. Company with a strong balance sheet are more likely to survive economic downturns than a company with a poor balance sheet. Having more assets than liabilities is the fundamental of having a strong balance sheet. Further than that, companies with strong balance sheets are those which are structured to support the entity’s business goals and maximise financial performance. Balance sheet, also known the statement of financial position, provides a business snapshot of what your company owns and owes through the date listed- usually at the end of a financial year. Comparing to earlier balance sheets, your current balance sheet will reflect your company’s ability to collect and pay debts over time. Therefore it gives current and potential investors informed decisions about lending you resources. 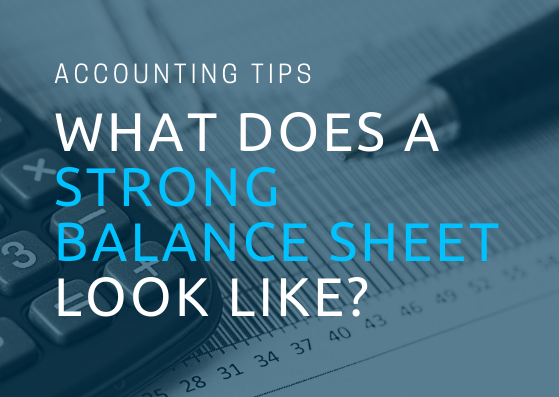 In addition, if you familiarize yourself with using financial ratios, the balance sheet can provide warning signs for you to solve before your business could get hit. How to analyse a balance sheet? Various financial ratios can give a better sense of the company’s liquidity as well as its ability to generate cash flow. Useful ratios used to analyse balance sheet are current ratio, debt ratio, debt to equity ratio and lastly, days sales outstanding ratio (DSO). A liquidity ratio that measures a company’s ability to pay short-term and long-term debts. A measure of the average number of days that it takes a company to collect payment after a sale has been made. Whenever assets are not generating a healthy return, liquidate them. Conducting financial ratio is a great way to determine whether your business is using its assets effectively and you may want to look at leasing assets or outsourcing production rather than purchasing them. This could be the most cost effective option, particularly for assets which date quickly such as those in the technology sector. When you hold a lot of inventory, your business’ inventory will result in a large bearing on your balance sheet. Too much inventory on your business’ balance sheet can create several significant risks that include losses being added onto the balance sheet and increased risk of inventory becoming obsolete or damaged. Moreover, holding more inventory than you need means that capital is tied in an as-yet productive asset rather than generating cash flow or improving your business’ financial stability. In the early stages of setting up a business, staffing costs can contribute a substantial part of business’ operating expenditure. Thus, employing only a realistic strength of staff can boost business equity. You can gradually increase staff strength as your business grows, rather than in anticipation of a future boom. Alternative financing cash flow solution i.e. Invoice Financing can grant your business fast funding by unlocking cash flows stuck in the receivables. Where liquidity of payment collection is enhanced, DSO ratio ↓, Debt ratio ↓ and Current ratio ↑. These ratios consequently help to contribute to a ‘healthier’ balance sheet.